Landscapes of living heritage: that playfully recall the route’s previous use and serve as a reminder that London’s food supply is as reliant on its networks now as it was then. Certain elements are inspired by drover folk-lore: Rowan trees were considered lucky. Spaces for slow activities: drovers traveled slowly along their routes to keep their cattle healthy; people need slow places too; to read, explore, graze and play. We propose permeable paving with hoof shaped holes to allow soak-away drainage. The plodding footsteps set the pedestrian tone for this green route. 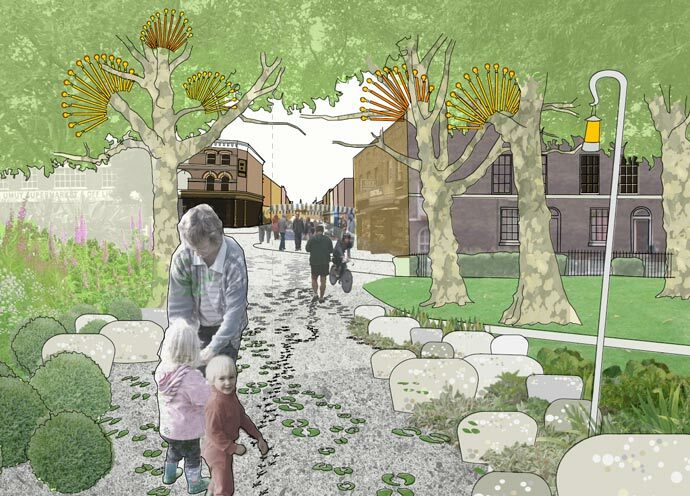 Green systems put to work: we propose to fuse hard and soft landscape elements that are traditionally separated: trees double as way-finding devices; paving is both a hard walking surface and a growing medium. Plant species are selected for biodiversity, trample resistance and to align with the concept; many of the plants have seeds that are transferred by animals. The design has exhibited at the Garden Museum and City Hall and is featured on a specially commissioned website here. A tour has also been developed around the design concept, featuring seed bombing, historical readings and a visit to the Hackney City Farm at the Chelsea Fringe Festival and Open House London.